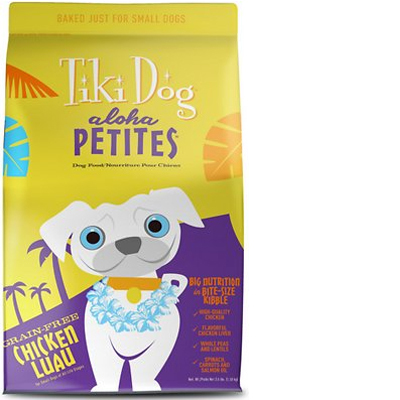 Tiki Dog Aloha Petites Chicken Luau is a mid-priced dog food with great quality. This product has no controversial ingredients, including zero artificial preservatives, colors or flavors. However, it has a somewhat high amount of carbs, compared to its protein and fat, but the meat and fat quality in the food is excellent. Tiki Dog has a below average number of recalls and was relatively transparent when answering our questions. Watchdog Labs recommends this product. This food has a good amount of protein and fat but is somewhat high in carbs, which is lowering the fat content somewhat and making it less nutritionally balanced compared to other dog foods we evaluated. Carbohydrates are cheap so they keep the food’s cost low. They are nutritionally useful to dogs in the right amounts, however, very high amounts of carbs can reduce the much-needed meat-based protein and fat content. Fresh Deboned Chicken, Chicken Meal, Peas, Fresh Chicken Liver, Lentils, Chickpeas, Tapioca, Natural Chicken Flavor, Chicken Fat (Preserved With Mixed Tocopherols And Citric Acid), Ground Whole Flaxseed, Spinach, Carrots, Salmon Oil, Dicalcium Phosphate, Sea Salt, Brewer’s Yeast, Calcium Carbonate, Monosodium Phosphate, Choline Chloride, Fructooligosaccharide (Prebiotic), Zinc Proteinate, Iron Proteinate, Rosemary Extract, Vitamin E Supplement, Copper Proteinate, Manganese Proteinate, Niacin Supplement (Vitamin B3), Vitamin A Acetate, Calcium D-Pantothenate, Riboflavin Supplement (Vitamin B2), Thiamine Mononitrate (Vitamin B1), Vitamin D3 Supplement, Vitamin B12 Supplement, Pyridoxine Hydrochloride (Vitamin B6), Calcium Iodate, Folic Acid, Sodium Selenite. The average dog food we reviewed has 39 total ingredients, with 1 controversial ingredient. This product has 0 controversial ingredients. That’s what you want to see in a food, great! Lentils are a legume that provide carbs, fiber, protein and numerous nutrients like folate, vitamin B6, phosphorus, iron and zinc. The U.S. Food and Drug Administration (FDA) has warned that there is a potential link between lentils and canine heart disease. It is still too early to draw conclusions so we cannot yet say if potatoes are a generally high-quality dog food ingredient or should be avoided. Tiki Dog Aloha Petites Chicken Luau has no controversial ingredients. Tiki Dog Food is made in Canada. That’s great, because regulations and quality standards for dog food manufacturing in Canada are equally high to those made in the U.S.
Tiki Dog shows clearly where the meats and added oils in this dog food originate from. On the label we see: Fresh Deboned Chicken, Chicken Meal, Fresh Chicken Liver, Chicken Fat (Preserved With Mixed Tocopherols And Citric Acid), and Salmon Oil. All of them clearly identify the animals they come from, excellent. 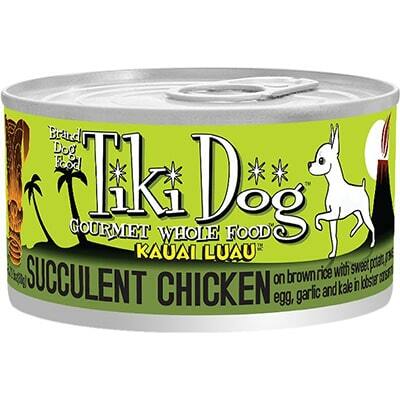 Tiki Dog Aloha Petites Chicken Luau contains 0 controversial artificial preservatives. It’s good to know that ‍not all artificial preservatives are bad. That’s because they serve an important purpose, which is to prevent food from spoiling. However, we consider 11 artificial preservatives controversial because of their potential link to cancer and other serious health conditions. Tiki Dog has a below average number of recalls. Tiki did not respond to the first email. A second email was sent a week later, a delayed response was received with the following answers. Tiki has dedicated pet nutritionists, food scientists, food engineers, and quality assurance managers to support product development and manufacturing. We are not able to disclose their information. We would prefer to know exactly who the professionals are that work on the product. We do not do feeding trials. Our products are formulated in compliance with AAFCO nutrient profiles. Our wet foods are produced in Thailand while our dry foods are produced in Canada. While we do visit each of them regularly to ensure quality and regulations, they are not open to the public for safety and quality assurance reasons. As part of our quality assurance, we apply close scrutiny to our manufacturers and suppliers along every step of our supply chain. Our manufacturing facilities are highly regarded and are held to strict quality assurance standards. Our co-manufacturing plants operate under programs like HACCP (Hazard Analysis and Critical Control Points), Sanitation Standard Operating Procedures (SSOP's), current Good Manufacturing Practices (cGMP's) and others under a system for managing food safety and quality. We are not able to disclose those manufacturers or exact locations due to our contracts with them. The majority of companies we spoke to are willing and able to share who their partners are. Not knowing exactly where the food is being made is concerning. The ingredients are globally sourced and from pre-approved suppliers only but we do attempt to source ingredients as close to the manufacturing facilities as possible unless an ingredient is not available or does not meet our quality standards. We are not disclosing exact locations, as we are under a non-disclosure contract with both our manufacturers and suppliers. Tiki carefully chooses our raw materials so that only the best, purposeful ingredients are in our final product.